Excellent development or investment opportunity to acquire a sizeable site with Outline Planning Permission for erection of 2 detached dwellinghouses. The site is close to the Town Centre, but offers a quiet location, with existing housing to three sides, and McJerrow Park on the fourth. The access route from Victoria Road comprises a tarmacadam road. The Plots are un-serviced, but it is believed connections are readily available to existing public utilities, subject to the appropriate consents. A copy of the Planning Permission is available upon request, from the Selling Agents, who should be contacted for further information. 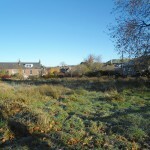 It is intended that the site will be sold as one Lot, although separate offers for each Plot may be considered. Lockerbie is a thriving market town which lies on both the national road and rail networks, making it ideally situated for access to the rest of the country. The surrounding countryside offers a varied choice for those seeking country pursuits such as fishing, walking and horse riding, whilst the town itself has an 18-hole golf course, bowling green, ice rink and squash court. The town also offers the usual range of shopping facilities, whilst the county town of Dumfries (some twenty-five minutes away by road) has two cinemas, a Leisure Centre and a wide range of national chain stores and specialist shops. Carlisle is twenty minutes’ drive to the south. Lockerbie has highly-regarded schooling to both primary and secondary level in a new combined School. 1. Solicitors in Scotland deal with all aspects of property transactions, including th marketing, sale, financing, purchase, leasing and factoring of both private and commercial properties.